Complete Original Affidavit PDF File THIS File! 1973 N. Rulon White Blvd. Copies: Copies of this affidavit and all 17 attachments are being supplied to listed parties. Please take NOTICE that I hereby add the following facts of law in support of this Affidavit of Truth and request for refund and damages through which the IRS and all related co-conspirers are officially being placed on Actual and Constructive Notice, and request this affidavit and attachments be added to my Individual Master File and previous affidavits: This is additional legal evidence of non-disclosure or lack of FULL disclosure of related facts by the IRS and other parties, and their continued constructive fraud against me. (Emphasis mine throughout affidavit and attachments). 1. In years past, I had been influenced and misled by the news media, including IRS press releases, tax preparers and by a misinformed public, into believing that I was subject to and liable for the so-called "income" tax, and that if I did not file Form 1040 Income Tax Returns and other IRS forms and documents by the April 15th deadline I would be subject to a fine and jail sentence. I no longer believe this to be Constitutional, legal or true in the slightest, and believe that the IR Code provides NO legal "income" tax liability documentation for most Americans. (See Attachment F). account, thereby eliminating any such "fund" from real existence, and deceiving the public with continued dialog regarding such fund. The "Medicare" tax is also another unconstitutional, illegal tax. (See Attachment M). 3. I had also been influenced by employers who indiscriminately require individuals to sign W-4 forms (Employee's Withholding Allowance Certificate) and provide social security numbers in order for the individuals to obtain jobs, but have come to learn that this is being fraudulently enforced, and that a SSN is NOT required for employment or for bank accounts and other things: (See Attachment M). 5. I have since learned and believe that only by the ignorant, voluntary signing of tax forms and the providing of a "social security" number does an "individual" seemingly create the necessary prima facie evidence (whether factually true or not) indicating that he believes he is a "person" who is legally subject to and liable for an "income"tax. I rescind this for all past activity, and if such SSN is requested for any future activities that I must engage in to adequately carry on my daily living, I do not give up any rights per UCC1-207 or other related code law, or do not agree that said SSN is tied to me as a free sovereign as a privilege, nor do I accept any benefits by being asked or required to providing said "social security" number to any party for any reason. (See Attachment M). 6. I have since learned and believe that the Internal Revenue Code states exactly who is liable for other taxes such as the excise tax on distilled spirits, clearly stating that the distiller or importer of distilled spirits shall be liable for the taxes imposed thereon (26 U.S.C. 5005(a)), and that I find no section in the Internal Revenue Code making me personally liable for any "income," "social security" or "medicare" tax whatsoever. 7. I have since learned and believe that the Internal Revenue Code relates only to those who are "taxpayer(s)" as that term is defined therein, that is, only those who are subject to or liable for a revenue tax (26 U.S.C. 1313 (b) and 7701 (a) (14); Economy Plumbing and Heating v. United States, 470 F.2d 585, 589 590(1972)), or who knowingly, with full understanding, volunteer to pay such taxes. I am NOT such a person. 8. I have since learned, and believe that IRC 26 was NOT enacted as "positive law," and therefore without legal jurisdiction over most Americans, and is being improperly and illegally imposed under the color of law, (See Attachment D) clearly making it constructive fraud. (See Attachment H). 9. I have since learned and believe that the United States Supreme Court has been quite clear in stating that a so-called "income" tax is in fact an excise tax (Brushaber v. Union Pacific R.R. Co., 240 U.S. 1, 16-17 (1916)), and (contrary to popular belief) the Sixteenth Amendment conferred no new power of taxation but simply prohibited such power of "income" taxation from being taken out of the category of indirect taxation to which it inherently belonged (Stanton v. Baltic Mining Co., 240 U.S. 103, 112 (1916)) and that it did not extend the taxing power to new or excepted subjects (Peck & Co. v. Lowe, 247 U.S. 165, 172 (1918)), and that an indirect tax is a tax laid upon the happening of an event, as distinguished from its tangible fruits (Tyler v. United States, 281 U.S. 497, 502 (1930), Knowlton v. Moore, 178 U.S. 41), and that excise taxes (being in the category of indirect taxes) are imposed or laid upon certain activities such as the manufacture, sale or consumption of commodities within a country, the exercise of licenses to pursue certain occupations, and the doing of business in a corporate capacity (Flint v. Stone Tracy Co., 220 U.S. 107, 151 (1911)). (See Attachment C). 10. I have since learned and believe that the "income" tax is not a tax on "income" as such and that it is an excise tax with respect to certain activities and privileges which is measured by reference to the "income" which they produce, and that the "income" is not the subject of the tax: it is the basis for determining the amount of tax (House Congressional Record, 3-27-43, page 2580). 11. I have since learned and believe that "income" received for "labor provided," is NOT what the Founding Fathers, or Congress, originally considered it to mean, and that the "exchange" of value (labor for cash or other compensation) provides nothing "materially different" that can be legally or Constitutionally "taxable" (See Attachment A). 12. I have since learned and believe that the Oregon Supreme Court was quite clear when it said that the individual, unlike the corporation, cannot be taxed for the mere privilege of existing, and that the corporation is an artificial entity which owes its existence and charter powers to the State; but the sovereign individuals' rights to live and own property are natural rights for the enjoyment of which an excise cannot be imposed (Redfield v. Fisher, 292 P. 813, 819 (1930)). 13. I have since learned and believe that the Tennessee Supreme Court was quite clear when it said that since the right to receive "income" or earnings is a right belonging to every human being, (sovereign - JTM) this right cannot be taxed as a privilege (Jack Cole v. MacFarland, 337 S.W.2d 453, 456 (Term. I960)). (See Attachment C). 14. I have since learned and believe that sections 6001 and 6011 of the Internal Revenue Code which indicate requirements to keep records and make returns apply only to those persons who are liable for or made liable for a tax (26 U.S.C. 6001, 6011). I am NOT such a person. persons who have "taxable year(s)" ("taxpayer's annual accounting periods") as that term is defined in the Internal Revenue Code (26 U.S.C. 441(b)). 16. I have since learned and believe that capitation taxes and taxes on profit FROM personal property (ANY personal property), wages and income being personal property, is in the category of direct taxes which must be apportioned among the States as required by the United States Constitution (Penn Mutual Indemnity Co. v. C.I.R., 277 F.2d 16, 19-20 (3rd Cir. 1960); Steward Machine Co. v. Davis, 301 U.S. 548, 581-582 (1937)). 17. I have since learned and believe that since capitation taxes and taxes on profit FROM property must be apportioned among the States in accordance with the United States Constitution, and neither the so-called "income" tax nor the so-called "social security" tax is apportioned among the States, they must therefore be in the category of indirect taxes which are taxes imposed on the happening of an event or activity (Tyler, supra), and since I do not find a tax imposed on any of the activities that I am involved in, nor do I find a section in the Internal Revenue Code that makes me subject to or liable for any tax, I must be without the scope of the revenue laws and, therefore, have absolutely no legal duty to sign any tax forms of any sort or make any return or report of "income" or pay any "income" or "social security" tax or keep any records or supply any information to the Internal Revenue Service whatsoever. (See Attachment A). 18. I have since learned that even though the index for Title 18 (the U.S. Criminal Code) lists crimes applicable to offenses involving firearms taxes, liquor taxes and tobacco taxes, no criminal offenses are listed for "income" taxes. Under the entries for the categories of federal alcohol, firearms and tobacco taxes, each contains sub-entries linking them to the specific US statutes enabling enforcement of such taxes by imposing legal sanctions for "failure to file or pay tax,""penalties," "record keeping," etc. Related entries also show clear references to "liability," "payment" and "tax on making," etc. No such entries can be found in the index entries under the category for "Income taxes." This means that none of the enforcement provisions of the Internal Revenue Code apply to "income" taxes, but only to Alcohol, Tobacco, and Firearms, and to such other taxes that are implemented by the regulations contained in CFR 27. Internal Revenue Manual Chapter 1100 Organization and Staffing, section 1132.75 states: "The Criminal Investigation Division enforces the criminal statutes applicable to income, estate, gift, employment, and excise tax laws involving United States citizens residing in foreign countries and nonresident aliens subject to Federal income tax filing requirements..."
I am a Colorado state de jure citizen domiciled in a "foreign" country relative to the United States, and am NOT subject to Federal income filing requirements. (See Point 21, 42). authority to collect "income" taxes, and (per 44 USC 1505) a copy of its publication in the Federal Register, which is legally required, simply does not exist and has not been provided although requests have been made to the IRS for such publication. 20. I have learned that the Federal Government, and hence, the IRS, has very limited jurisdiction within the sovereign 50 states, pursuant to Article 1, Section 8, Clause 17 of the Constitution. This means the IRS has NO jurisdictional authority over ANY sovereign de jure citizen of the several states, and therefore ANY IRS action against any sovereign citizen is illegal and only under the color of law. (See Attachment B). 21. I have also found in IR Code research that most Americans are "nonresident aliens," but ONLY in regard to the corporate "United States." De jure State Citizens are legally "nonresident aliens" with respect to the municipal jurisdiction of the federal government, and that is the major reason why they are NOT embraced by the legal definition of "U.S. Persons." This further clouds the issues and indicates that most Americans are NOT subject to "United States" (a corporate entity consisting of federal territories such as Washington, D.C., Puerto Rico, etc.,) "income" taxes, and therefore, not required to pay income tax unless working for the Federal Government, a privilege for which taxation may be required. (See Attachment B). 22. I have since learned and believe that both the United States Congress and the Internal Revenue Service use names and definitions in a deceiving way and that the common understanding of these names is misleading and causes misunderstandings and confusion when trying to establish actual individual tax liability. By deceptive and misleading words and statements in the Internal Revenue Code, IRS publications and news releases, the IRS has, by means of constructive fraud, deceived me, as well as the general public, into believing that Congress had imposed a direct tax on our earnings when in fact only persons involved in a taxed activity or event could possibly be subject to or liable for an unapportioned tax, and by such deception, have created the greatest extortion ever perpetrated upon a nation of free people in the entire history of the world. (See Attachment A). 23. I have since learned that an artificial entity with my same name, known as "JEFFREY T. MAEHR," IN ALL CAPS (The "straw man" - See Blacks Law Dictionary, 4th edition), was fraudulently created for me (and all Americans) at the time of birth, and that such artificial entity is a corporate fictional entity through which the Federal Government has been "doing business" with the real "me," and yet deceptively misinforming me as to my liability for said artificial entity. (See Attachment N). Secretary of State of Colorado and Iowa, and accepted. (Copies attached). I also reserve all rights to myself if I am compelled, and left with no reasonable recourse, but to use Federal Reserve Notes as "payment" of supposed debt, and do not accept this as a "privilege." 25. Any and all presentments from the IRS are dishonored, and ANY previously signed forms, contracts, letters of any kind, or other agreements made under the color of law, I hereby rescind my signature to. I am among the sovereign national citizenry of the United States of America, and a de jure citizen/national of Colorado and claim all right as a sovereign. 26. I have since learned and believe that the 16th Amendment was not legally ratified as required by the Constitution, per certified documentation outlined in the book, "The Law that Never Was," by Bill Benson, and which fact is now before the court to be decided per UNITED STATES OF AMERICA v. WILLIAM J. BENSON, CASE NO. 04C 7403. It is my firm belief that the 16th Amendment was NOT legally ratified, based on this evidence, and this also contributes to the overwhelming evidence against the fraudulent implementation of "income" tax collection, which is based, wrongfully and under the color of law, largely on this Amendment alone. 27. In the Supreme Court Case "CHEEK v. UNITED STATES, 498 U.S. 192 (1991), the court states: "Willfulness, as construed by our prior decisions in criminal tax cases, requires the Government to prove that the (1) law imposed a duty on the defendant, (2) that the defendant knew of this duty, and (3) that he voluntarily and intentionally violated that duty." (See Attachment F). My acts are not "willfully" criminal, under law, but ARE patriotic and in defense of my countrymen and my oath to defend the Constitution. 28. I have repeatedly petitioned the IRS and other government officials, including Senators and Representatives, for answers to these and hundreds of other questions, and to provide answers to or rebuttal to, my affidavits over the last 3+ years, but no relevant answers have been forthcoming, and I therefore stand on my position and belief as being true, by default, and all I have presented is entered into the public record declaring this belief. Documentation available. 29. I also obtained my Individual Master File (IMF) through the Freedom of Information Act (F.O.I.A. ), and believe it contained illegal, human-entered entries which overrode the computer programming, creating a false tax liability against me. It also indicated that the "Social Security" number assigned to me was in use by at least one other person, and that I was living in a foreign country, among other incorrect entries, which I rebutted, and yet received no acknowledgment of such corrections. 30. I have since learned, proven and believe that the IRS is acting outside its authority, under the color of law, using constructive fraud, intimidation and force, to illegally extort money from most Americans. This constitutes treason. (See Attachment D). 31. I have since learned and believe that the IRS is committing mail fraud in EACH use of the U.S. Mail service to correspond with Americans in attempts to extract "income" taxes contrary to law, such as the "Notice of Lien" mailed to me and to my banking institution where no actual lien existed, (See Attachment Q) extracting funds by placing the bank under duress and intimidating THEM into breaking the actual laws. All such mailings constitute prima facie evidence against the IRS. In addition to this, the IRS claims to use IRC section 6331 as their authority to levy on private citizens, when it only applies to government employees, and the IRS regularly uses the U.S. Mail system to illegally demand "income" taxes from NON-government employees. 33. I have since concluded and believe that IRS efforts to force me to break the law and the Constitution of America is a violation of my sovereign right to practice my religion freely according to my personal beliefs by attempting to force me to lie, commit fraud and disobey the supreme laws of the land as commanded against by God and the bible. My sovereignty is God-granted and Constitutionally supported, and cannot be legislated away. (See Attachment L). 34. I have since learned and believe that this fraudulent financial system of fiat/fake money creation and wealth collection system between the Federal Reserve, IRS and U.S. government is completely unbiblical, unethical, unlawful and contrary to my religious beliefs regarding finances and dealing with others which I've held for over 23 years, and that it is directly responsible for subjugating people and nations, and allows the massive illegal and unconstitutional spending by the U.S. government and Congress. This constitutes treason. (See Attachment I). 35. I have since learned and believe that all Government agencies and individuals that are countering the Constitution of the United States of America are committing treason, at the very least, and are to be classified as domestic enemies (terrorists) of the Constitution and of the American people, which I am bound to resist and expose. I am a disabled Navy Veteran, who took an oath to uphold the Constitution from all enemies foreign AND domestic as part of my defense of my country, and am still bound to that, even though my active service was cut short by the injury. I am upholding that oath by educating others through this affidavit and my firm belief in what I understand about the laws as written. MORE prima facie evidence that I firmly believe the government to be illegally and fraudulently applying the "income" tax system, and is involved in other illegal and unconstitutional acts. 37. I am hereby including some of the relevant sources for the enclosed legal IRS information, which I base this affidavit on, including web pages and books on these subjects. (See Attachment E and Attachment M). 38. I am NOT a "tax protestor," and not "anti-government." I AM anti-corrupt, illegal government, and against fraud and unconstitutional activity by any. I pay taxes in many forms, including sales tax on all sales in the state of Colorado which my business collects, as required by state law and presumably supported by the Constitution of the United States of America, although this, too, is under investigation and I reserve my right to change this belief if the facts warrant it. 39. 13th. Amendment (The Second 13th Amendment...See Attachment K) to the U.S. Constitution states in Section 1. "Neither slavery nor involuntary servitude, except as a punishment for crime whereof the party shall have been duly convicted, shall exist within the United States, or any place subject to their jurisdiction." Being forced to pay taxes on my own "exchanged" labor (See Attachment A) is to place me in "involuntary servitude," making me a slave to the government and is another violation of the Constitutional requirements for taxation and of my rights. (See Attachment J). 40. I have reason to believe that the FIRST 13th Amendment provides proof of the lack of jurisdiction and authority of B.A.R. (British Accreditation Registry) attorney and judge proceedings over me, (or any), as a sovereign de jure citizen of the several states of America, and I question the validity of ANY "BAR" member as a constitutionally legal judge or attorney to be trying me or defending my constitutional interests as an American. (See Attachment K). 41. I have reason to also believe (but not conclusive to date) that IRC 1.861-8 "Computation of taxable income from sources within the United States and from other sources and activities" reveals that "taxable income" being discussed is relevant ONLY to International citizens living in the U.S. receiving such income. The People of this Country have the Constitutional right to withhold any money from government coffers until they answer the People's questions, which the IRS and other government agencies have consistently refuse to do: (See Attachment A). 43. I have since learned and believe that the "United States," as defined in IR Code, is NOT the same as "United States of America," (USA is defined as the 50 sovereign states NOT under U.S. jurisdiction) as defined in the IR Code, and that ONLY "United States" 'citizens' i.e. ONLY those living within the jurisdiction of the "United States" such as Washington D.C. Guam, Puerto Rico and other possessions of the "United States," could "possibly" be liable for "income" taxation as IR Code hints at, also barring other significant evidence to the contrary. (See Attachment B). 44. I have since learned and believe that all court actions by the IRS have excluded proper Due Process, without a "Fully Informed Jury," (as to their rights and duties under the law, to both judge the actual facts as well as the law itself, and vote their conscience), and that this and other vital legal relevant defense evidence has been withheld, suppressed or objected to, contrary to Constitutional and Common Law rights. (See Attachment G). 45. I have since learned and believe that most courts in the U.S.A. are NOT Article III courts, and therefore have no jurisdiction over sovereign states or sovereign de jure human beings, and that ONLY actual Article III courts, or the Supreme Court, has jurisdiction over such.. (See Attachment K). 46. I have since learned and believe that the so called "social security" system is a fraud and is deceitfully used to extract even more wealth from Americans. (See Attachment M). 47. Research to date proves that I, nor anyone else I know or have ever known, has never voted for income taxation nor would they approve of income taxation should they know and understand the legal facts, and the fraud, which has been unfolded across the decades, and the actual unconstitutional spending and activities by government. 48. There is hereby also entered, inclusive of this entire document, an "Affidavit Denying Existence of Corporation" ("Specific Negative Averment") per Federal Rules of Civil Procedure, III. PLEADINGS AND MOTIONS, Rule 9, Pleading Special Matters. (See Attachment N). 49. I have also been provided evidence on a massive scale that the U.S. government was involved in illegal and criminal activities surrounding the 9/11 attacks, and other crimes, which I must declare by material knowledge, and belief of, or be liable in the continuing cover-up. These actions by the government constitutes treason, and support IRS illegal activity allegations. (See Attachment O). 50. I have since learned and believe that all my personal property such as land, buildings, vehicles, etc., under Common Law and in regard to free sovereigns is "allodial" property, owned free and clear of all encumbrances when illegally contracted, without full disclosure. (See Attachment P). 51. "For a crime to exist, there must be an injured party. There can be no sanction or penalty imposed upon one because of this exercise of Constitutional rights. "- Sherar v. Cullen, 481 F. 945.
no jurisdiction over me by the IRS, and no legal standing. (See Attachment B). 52. This affidavit and attachments is meant to reserve all my rights, and cover ALL additional illegal and unconstitutional laws and procedures (now or ever) against me not specifically mentioned in this document or known at this time, and I base any and all rights under organic and other pertinent laws, National or International, in perpetuity. I also provide this entire document as "Prima Facie" (See Attachment F) evidence of fraud and criminal activities, to be acted upon by legal authorities. PACIFIC MUTUAL LIFE INSURANCE, INC. Forced Labor: Being forced, through this constructive fraud, to expend my personal and business time on unnecessary record keeping and form filing (valued at $50 U.S. dollars per hour), and amounting to 2000 hours since 1969, totaling $100,000 (See Attachment D). Grand SUB Total Owed: = $96,279,880 - (Ninety Six Million Two Hundred Seventy Nine Thousand Eight Hundred Eighty Dollars), payable as described below, NOT YET including ALL "income"taxes unwittingly paid under constructive fraud since 1969. By reason of the above-stated facts which have gone unrebutted to date, and the affidavits and evidence already filed with the IRS, I again exercise my right to rescind, cancel and to render null and void, from the time of signing, each and every document containing my signature which would indicate in any manner whatsoever that I was ever subject to or liable for any internal revenue tax, or other tax of any kind, I hereby, with this notarized affidavit, and public filing of this entire document and attachments, lay claim to all previous collected funds which the IRS fraudulently collected contrary to my claimed rights, plus the allowed-for compensatory and punitive damages as calculated above, and demand said funds in total payment to secured party, Jeffrey T. Maehr, or his heirs, in perpetuity. To avoid a legal case, and far greater punitive damages because the IRS was previously placed on Notice regarding its actions via all provided evidence added to my entire Individual Master File over the last 3+ years, but was ignored by the IRS and the IRS continually pursued this constructive fraud, I am requesting that you respond with certified rebuttal within 21 days, (See Attachment N), or the full payment in Gold or Silver, or with certified check in my natural name, or wiring of funds to an account of my choosing, (both under immunity to prosecution) within 90 days of the expiring 21 day deadline above. Actual income taxes collected since 1969, plus 36 years interest on income tax principle, and subsequent "income," "social security" and "medicare taxes" defrauded in 2005 from me, will also be bound to the initial total monies due me, and to include compensatory and punitive damage awards. IRS records can verify this amount based on total social security taxes defrauded. If no documented, legal and certified point-by-point rebuttal to this Affidavit of Truth and attachments is forthcoming within 111 days of your receipt of it, under UCC Law, Common Law, Constitutional Law, and Law of Nations, it will indicate IRS acceptance of, and agreement with, ALL the facts previously presented in this affidavit and attachments, create a Security, (15 USC), and an accounts-receivable (See Attachment R), and make the IRS, and other related agencies, permanently liable for all claimed amounts and damages, payable to me, or my heirs in perpetuity, until paid in full as allowed above. 15% interest per MONTH required on all uncollected monies due me beginning exactly 120 days from the date of this affidavit, till total claim is paid! I hereby affix my lawful signature WITH EXPLICIT RESERVATION OF ALL MY UNALIENABLE RIGHTS, WITH HONOR AND WITHOUT PREJUDICE, pursuant to U.C.C. 1-207 and U.C.C. 1-103.6 and other claimed rights under UCC Law, Common Law, Constitutional Law, and Law of Nations, or other appropriate laws, known or unknown. 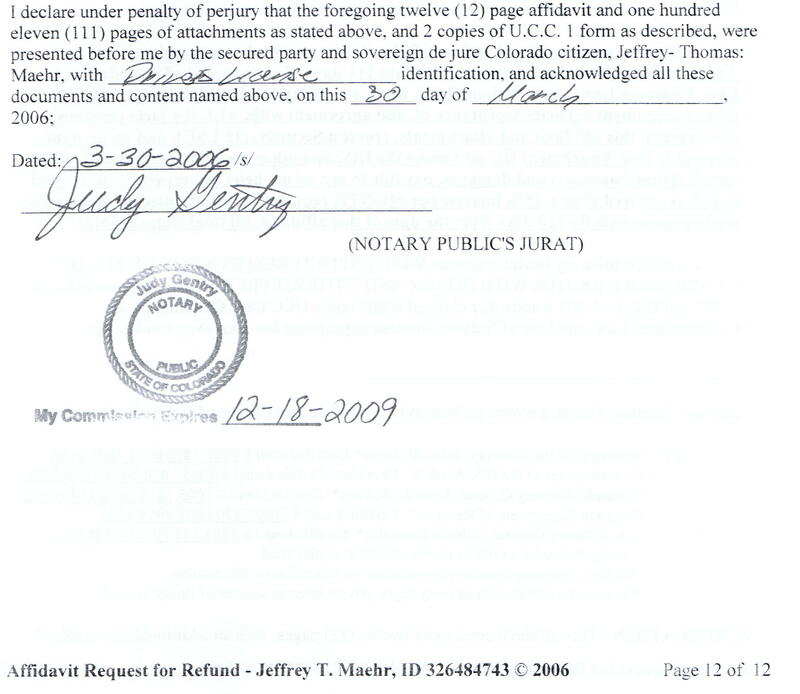 Jeffrey- Thomas: Maehr, a sovereign human being and de jure Citizen of Colorado nation/state. -County Recorder's Offices across America: copies filed. -Multiple Newspapers ads across country on this affidavit information. -Published with Other third party legal, private internet sources of Public record. VERIFICATION - This affidavit consists of twelve (12) pages, with an additional one hundred eleven (111) pages of attachments, as attachments "A," twelve (12) pages, "B," seventeen (17) pages, "C," five (5) pages, "D," six (6) pages, "E," one (1) page, "F," twelve 12) pages, "G," three (3) pages, "H," four (4) pages, "I," eight (8) pages, "J," two (2) pages, "K," five (5) pages, "L," four (4) pages, "M," four (4) pages, "N," five (5) pages, "O," four (4) pages, "P," two (2) pages, "Q," sixteen (16) pages, and "R," one (1) page, as well as 1 copy of U.C.C. 1 filing with Colorado nation/state and 1 copy of U.C.C. 1 filing with Iowa nation/state. Total document consists of 125 pages. * Notice: All parties copied on this document are also "On Active and Constructive Notice" and must respond with point-by-point rebuttal, or, by default, do agree to the legal merits of this affidavit, and are held legally liable to these demands under U.C.C. Law, Common Law, Law of Nations, Organic Constitutional law, and God's law, as applicable. This document in its entirety is published in the public domain by Jeffrey- Thomas: Maehr, Copyright (C) 2006, and is admissible as evidence in any court or other proceedings of any kind.